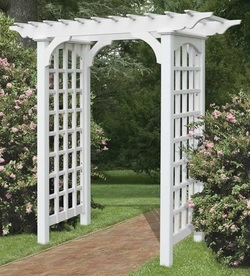 An Arbor, although similar to a Pergola, is not the same as a Pergola. Whereas a Pergola covers a Walkway, typically, an Arbor covers only a small area of space! Arbors are much smaller than Pergolas. Arbors are typically used to indicate the entrance to a certain part of your yard/area! Arbors are perfect for that Unattached Deck that gets just a little bit too much sun. An Arbor typically is not a place for a lot of seating, but one of our Custom Benches will look great in your Custom made Arbor. Your Arbor is perfect for ALL occasions! From Pool/Hot Tub Coverings, to a nice seating area to enjoy the Great Outdoors without fighting the Elements! All of our designs are Custom Made! Each Arbor we Design and Build has a Unique and Special Touch. We want you to be proud to call it your own! We aim to give you a jaw dropping Arbor that you will Love for years to come! Each project we undertake is special to us! The materials are Custom Bought per Hardscape. We want only the BEST for you and your new Backyard addition! Our team looks forward to working with you and getting you the Arbor of your Dreams!